About a decade ago I had a neck injury which caused me to stop lifting weights for a few years. When I was finally feeling better my enthusiasm for exercise led me to do too much too soon and I ended up with a very unpleasant case of Golfers Elbow in both forearms. I tried stretching but that only felt better for a minute or two. Massage and/or acupuncture both helped it feel better longer, but as soon as I began doing pull-ups or lifting something heavy, it hurt all over again. Then a client of mine, who was also a physical therapist, introduced me to the Reverse Tyler Twist with the Flexbar, and that changed everything. The pain went away and never came back! Before I show you the awesome exercise that helped me heal, I'd like for you to understand what causes tendinitis and how to avoid it in the future. It also helps to know that I've spoken with numerous tennis players who had golfer's elbow, and golfers with tennis elbow. So in this post I'll cover how to identify one from the other and exercises for each. The first thing we should clear up is that what we are calling tendonitis is actually tendonosis. Repetitive Strain injuries are due to chronically injuring the tissues and not giving them sufficient time to heal. This could be due to a sport, hobby or work demands...an activity that's regularly exposing your tendon to more force than it can withstand. A average tennis racquet weighs between 9 and 11 oz. But when you accelerate it through your backhand or decelerate your forehand, the load going through your wrist extensors multiplies. But the real damage is done when your hit the ball and the shock load can be as high as 100 lbs. By the way, hollow core racquets are most likely to cause injury because they transfer the most shock whereas triple core are the least likely to hurt you. The same concept applies to swinging a golf club and Golfer's Elbow. Golfer’s Elbow or Tennis Elbow? It is now time to identify whether you have lateral epicondylosis (Tennis Elbow) or medial epicondylosis (Golfer's Elbow)...or both...or perhaps neither. Test 1: Use your thumb to press the medial epicondyle. Test 2: Straighten your injured arm with palm facing up. Use the opposite hand to bend your hand down at the wrist but resist it with the injured arm. Test 3: Using your injured arm, pick up a moderately heavy object with your palm facing up and elbow straight. If any of these tests hurt on the medial epicondyle (the bony spot on your arm that I’m touching in the first photo) you probably have golfer’s elbow. Test 1: Use your finger to press the lateral epicondyle. Test 2: Straighten your injured arm with palm facing down. Use the opposite hand to bend your hand down at the wrist but resist it with the injured arm. Test 3: Using your injured arm, pick up a moderately heavy object with your palm facing down and elbow straight. If any of these tests hurt on the lateral epicondyle (the bony spot on your arm that I’m touching in the first photo) you probably have tennis elbow. Now that you know which type of elbow tendonitis you have, the very first thing to do is get a Flexbar. They're inexpensive and you'll need one to perform the corrective exercise. Don't maybe get it...definitely get it...in fact, order it as soon as you finish reading this page. It's not something I ever see sold in stores, so the easiest place to get it, is Amazon. They range anywhere from $13 to $20 US. The next question is, which resistance level should you buy? Guys, don't get too cocky here. You have this injury because the tissue was weak. I'll walk you through an approximate explanation of how to gauge strength for these. Yellow Flexbar - Extra light, offering 6 lbs (2.5 kg) of resistance. For most, this will be too easy. But if you rarely perform manual labor or any type of training/sport that requires grip work such as swinging racquets and clubs or lifting weights, this is where you should start. Red Flexbar - Light, offering 10 lbs (4.5 kg) of resistance. This is the best place for most people to start. If you perform light manual labor or any type of training/sport that requires grip work such as swinging racquets and clubs or lifting weights and perhaps you increased your intensity too quickly and got hurt, begin here. Green Flexbar - Medium, offering 15 lbs 7 kg) of resistance. This a good "injury prevention" resistance level for most people to use after they've healed and gained strength. With that said, if you already do grip training and have strong forearms, this may be an appropriate place for you to start. Blue Flexbar - Heavy, offering 25 lbs (11 kg) of resistance. If you're strong enough to start with this resistance level than I have no idea how you got elbow tendonitis. You can get this one to use once you've outgrown the green and you want to be a beast, but don't try starting here...that's just silly in my opinion. Personally, I hurt my elbows in my late 20's. I stopped lifting after a neck injury and mostly did yoga for a few years. But when I healed and got back into lifting, I went too heavy too quickly, causing both Tennis and Golfer's Elbow in both arms. I started with the red Flexbar and now use the green occasionally for maintenance. The next tool I recommend getting is The Stick. You can recover without it, but in my opinion, not as quickly or as well. You'll see why in a minute. This should be pretty obvious because it will hurt when you do the offending activity. And it might not be just one activity. Anything that makes your elbow tendonitis pain worse, falls under this category. Ideally you’d be able to completely stop doing any activity that worsens your injury until it is healed. But sometimes that’s not realistic, so try to at least reduce how much you do them, and maybe even alter the way you do them. And sometimes, there is no escaping these activities because they're a part of your business or it's golf season, and let's not kid ourselve. In this situation you need to double your efforts at steps 3 and 4. This is when I recommend wearing an arm brace for support. Essentially, the brace works by compressing the tendon above the pain sites, adding a form of external structural support. This can help minimize further injury while you get through a specific work project by taking tension off of the trigger points and tendon. One further clarification before we move on...if your elbow hurts when training at the gym, it doesn't mean stop training altogether. It means modify or change out the exercises that aggravate your injury, but keep everything else. For example, many people get Golfer's Elbow from pull-ups. If you don't want to completely lose the strength gains you've worked so long and hard for, try lat pull-downs with a similar grip. But slow your tempo way down to 3 seconds on the concentric phase (the positive), 2 second hold in the isometric phase (at the bottom) and 4 seconds on the eccentric phase (the negative). The slower tempo and lighter weight should help avoid a shock load from going through your tendon while keeping you challenged. Want an Exercise Program that Improves Your Golf Performance While Reducing Shoulder and Back Pain? Trigger points are tight little bundles of muscle fibers that feel tender when you press them. They can occur when a muscle is contracted for long periods of time and they get stuck in a shortened position, such as when you spend a lot of time typing and using a mouse on a computer. Interestingly, they also occur when a muscle is weak and overstretched. Sections of the muscle will contract defensively so as not to stretch to the point of tearing. 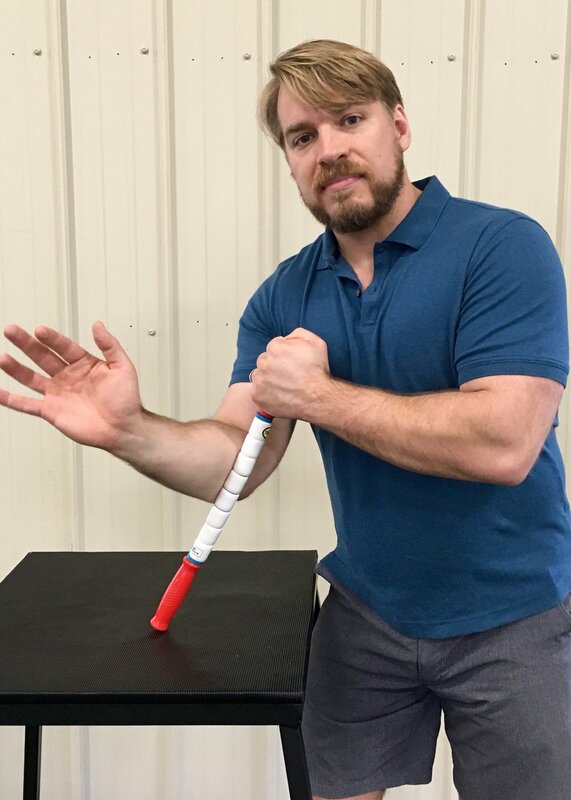 Trigger points in your forearm are best released by regularly using a self-massage tool like The Stick (the small, less expensive one works just fine). You can also see a massage therapist or acupuncturist. An additional muscle with trigger points that can affect tennis elbow is the tricep. This is a great muscle to have a massage therapist dig in on but you can do a good job yourself with The Stick or a foam roller. If you've ever seen my original elbow tendonitis video on Youtube I said that over-stretching of the tendon was part of the problem and therefore shouldn't be part of the solution. Well, 4 years later I'd like to modify that statement a bit. I still believe it to be part of the cause but I believe it can have it's place in recovery if done properly. And I believe the proper time is after massaging the trigger points to help "unstick" the muscle fibers even further. When you gently release tension from the tight muscle it lengthens and becomes more elastic. This, in turn reduces the possible shock loads on the injured tendon. Remember earlier when we discussed shock loads? Well, the more elasticity the muscle has, the more it can absorb dynamic forces so the tendon doesn't have to. It can also increase circulation and muscle function for the next step. Sometimes it’s incredible how much better you can feel just by stretching the right muscles and releasing muscular tension, but don't stop there! Step 5 is where the magic happens. Your tendon wasn't strong enough to hold up against the stresses you exposed it to. Your muscles weren't strong enough to absorb the shock loads as they lengthened during eccentric contractions. Therefore, this is the most important step by far. Perform 3 sets of 10-15 slow reps daily. When you can easily perform all 3 sets for 15 reps, it's time to begin using a more challenging Flexbar. The injury site should feel sore, and maybe even hurt a bit while doing the exercise. That's because you are intentionally stressing the tendon in order to stimulate growth and realignment of the collagen. Golfer's Elbow 1 - Hold bar with injured arm. Golfer's Elbow 2 - Lift uninjured elbow high while grabbing bar, palm facing away. Golfer's Elbow 3 - Squeeze tight. Golfer's Elbow 4 - Straighten both arms while flexing the wrist of the inured arm. 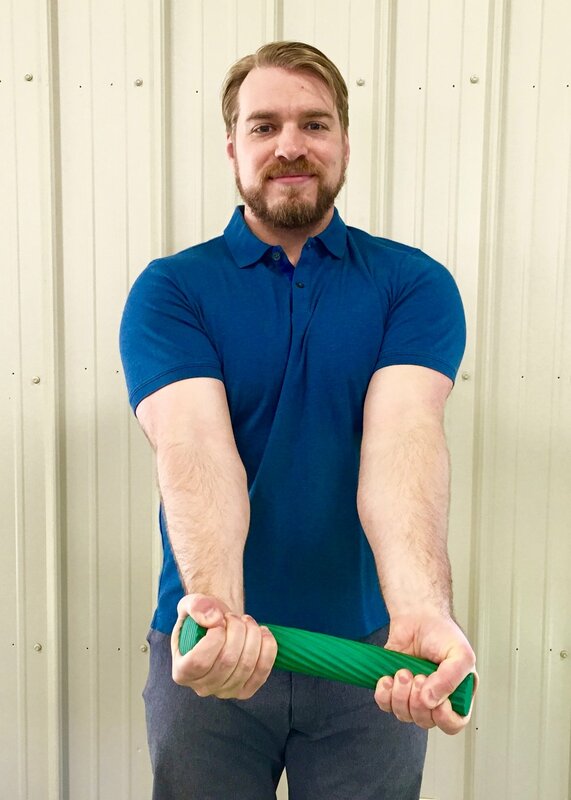 Golfer's Elbow 5 - Slowly allow the wrist of your injured arm to extend while squeezing the bar. Reset your grip for each rep.
Tennis Elbow Exercise 1 - Hold bar with injured arm. 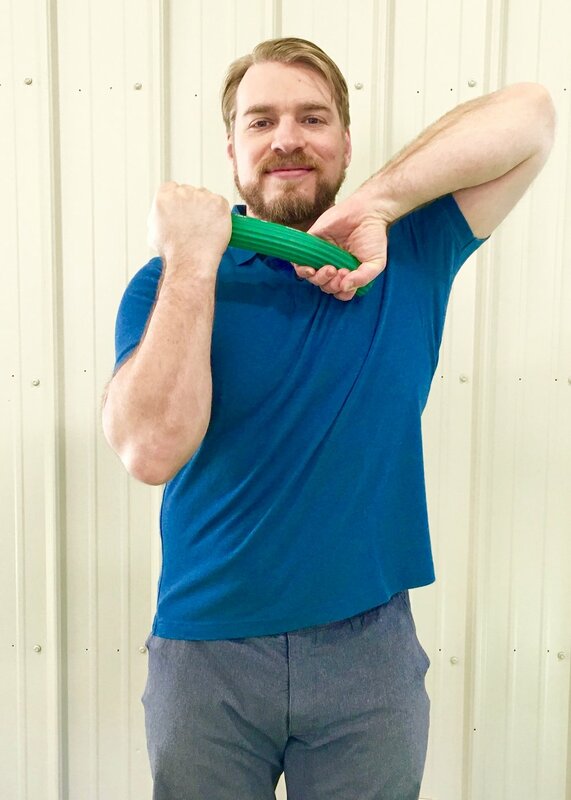 Tennis Elbow Exercise 2 - Lift uninjured elbow high while grabbing bar, palm facing away. Tennis Elbow Exercise 3 - Squeeze tight. Tennis Elbow Exercise 4 - Straighten both arms while extending the wrist of the injured side. Tennis Elbow Exercise 5 - Slowly allow the wrist of your injured arm to flex while squeezing the bar. Reset your grip for each rep. NOTE: Even though you should feel sore during the exercise, you shouldn't feel it the next day. If you do, it means something is injuring the tissue still. Is there something in your daily activities that still needs to be modified until you’re healed? Also, try slowing down your Flexbar reps and consider if you started with too high of a resistance level. If you’re suffering with elbow tendonitis, go ahead and order the Flexbar right now, it's only about $20. Then, call your doctor or physical therapist’s office to get an evaluation. Chances are, by the time you go to your appointment the Flexbar will have already arrived and you’ll have used it a few times. If your tendonitis is feeling better, you’ll impress your PT with your proactive approach and they can help speed the healing process along. If you’re not feeling better, than it’s a good thing you made that appointment, huh?! Do your exercise program prevent injuries while improving your athleticism? Schedule a complimentary Strategy Session to learn how we can help. I've had many people ask if they can use a dumbbell instead of the Flexbar. And the truth is, some people can if they really understand the biomechanics of what we're trying to accomplish. The key to eccentric contractions for healing a tendon is to create enough resistance through a full range of motion without shock loading at the beginning or end of the range of motion. This is very tricky with free weights because gravity is constant and always pulling in one direction. With the Flexbar, there is practically no shock load at the beginning of the exercise and because of how it uncoils there is literally zero shock load at the end. Plus, the resistance isn't gravity driven which means it can be more consistently applied through different angles of wrist extension. WHAT DO YOU THINK ABOUT CORTICOSTEROID INJECTIONS? I also believe that treating the pain takes away much of the motivation for people to be consistent with their exercise regimen and possibly become careless about avoiding activities that aggravate the injury. Research shows it can provide benefits. I will admit, I personally never bother with ice except for cocktails. I've healed just fine without it but it's an "arrow in your quiver" to help reduce pain. Think this Blog Post Is Thorough? You Should Check Out Our Training Programs! Tendinopathy: Why the Difference Between Tendinitis and Tendinosis Matters Int J Ther Massage Bodywork. 2012; 5(1): 14–17. Published online 2012 Mar 31. Ibuprofen inhibition of tendon cell proliferation and upregulation of the cyclin kinase inhibitor p21CIP1 J Orthopedic Resear. 2004 22(3):586–591. doi: 10.1016/j.orthres.2003.10.014. Addition of isolated wrist extensor eccentric exercise to standard treatment for chronic lateral epicondylosis: a prospective randomized trial. J Shoulder Elbow Surg. 2010 Sep;19(6):917-22. doi: 10.1016/j.jse.2010.04.041. Epub 2010 Jun 26. A NEW EXERCISE FOR TENNIS ELBOW THAT WORKS! N Am J Sports Phys Ther. 2010 Sep; 5(3): 189–193. CLINICAL OUTCOMES OF THE ADDITION OF ECCENTRICS FOR REHABILITATION OF PREVIOUSLY FAILED TREATMENTS OF GOLFERS ELBOW Int J Sports Phys Ther. 2014 May; 9(3): 365–370. Radial Tunnel Syndrome, Diagnostic and Treatment Dilemma Arch Bone Jt Surg. 2015 Jul; 3(3): 156–162. Published online 2015 Jul.